On Thursday, April 13, 1911, at New York’s Polo Grounds, the Philadelphia Phillies defeated the New York Giants, 6-1. 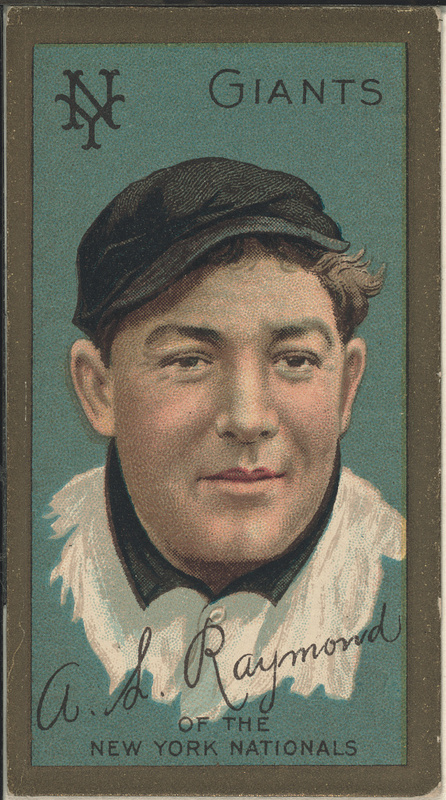 It was an unremarkable game – the second of the season – and Giants losing pitcher Christy Mathewson was not yet in the form that would lead him to 26 wins that season and an NL-leading 1.99 ERA. 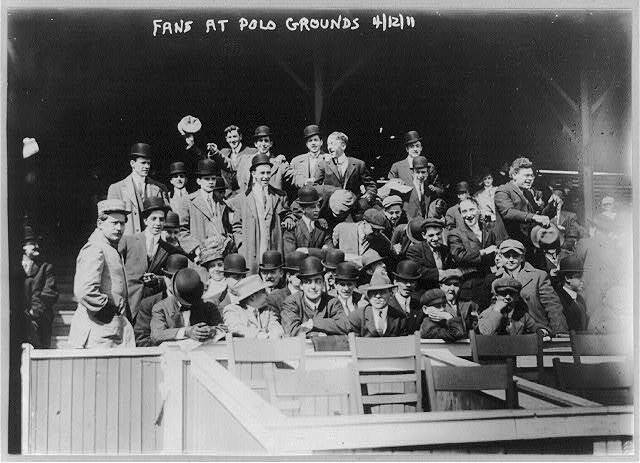 Fans at the Polo Grounds, a day earlier, April 12, 1911. 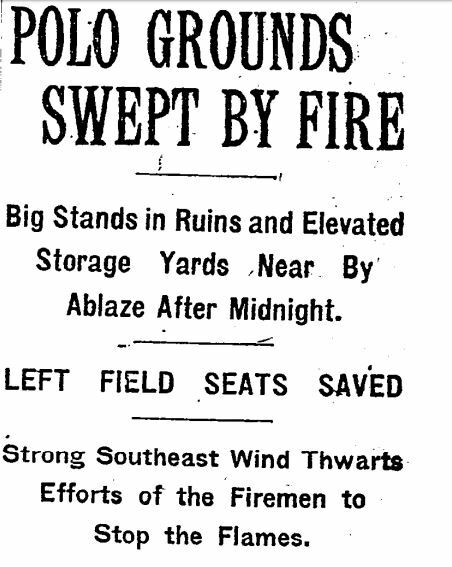 A few hours after the game, around midnight, the grandstand of the Polo Grounds was engulfed in flames. By morning, the grandstand and the right field bleachers had burned to the ground. 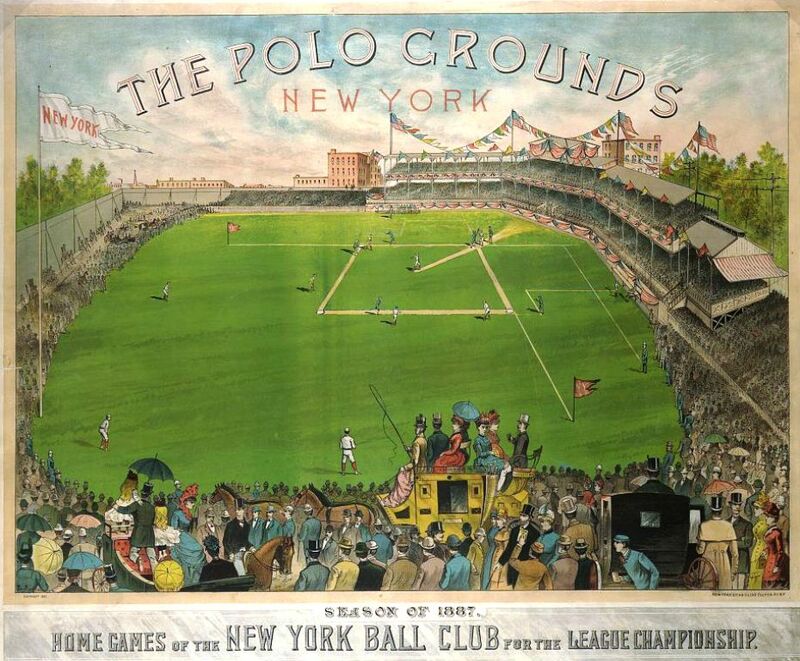 This Polo Grounds, with its massive wooden double-decker grandstand, was built in 1890, the third iteration of the legendary park. Baseball eventually elbowed its way in. (So did football and boxing and concerts.) The Polo Grounds became home to the Giants, and the Yankees (who borrowed it for a few seasons), and, finally the Mets. It came down for good in 1964. 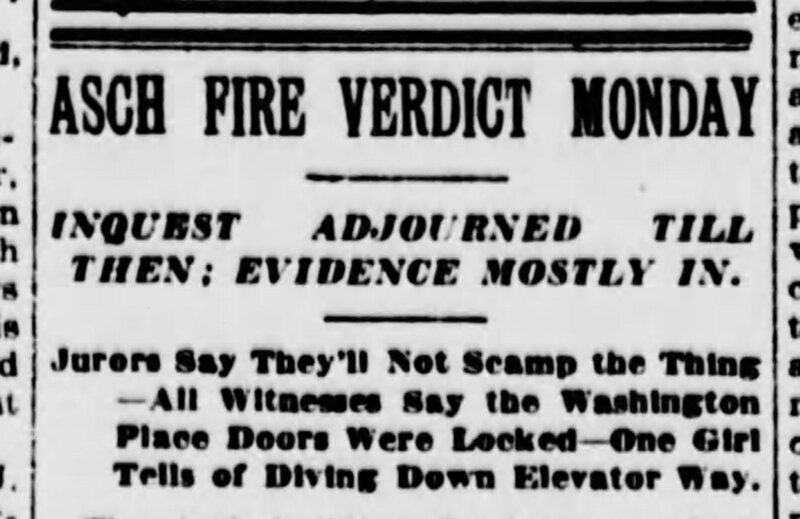 No one knows for certain what started the fire that night in 1911. 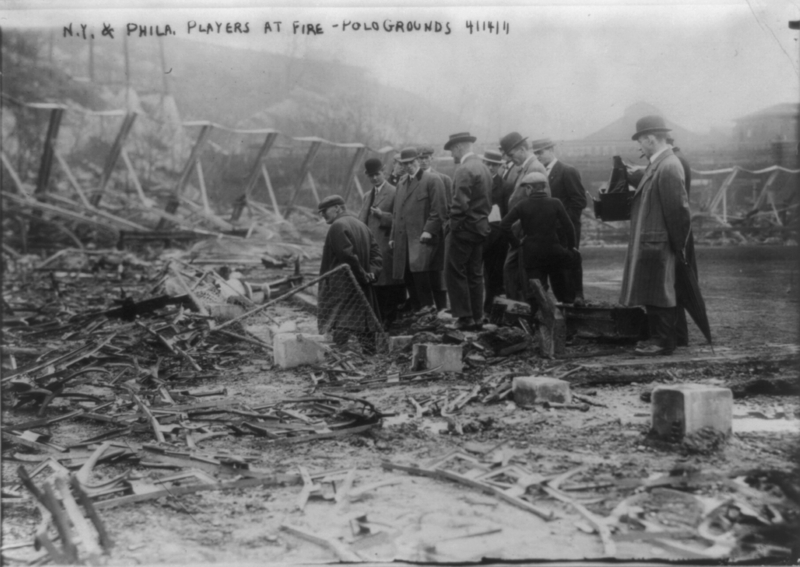 Giant and Phillie Players survey the ruins. Some people swore they heard an explosion, and the explosion theorists blamed a peanut roaster – stowed with its tank of gasoline under the grandstand. Others swore there was no explosion and there was no gasoline stored in the peanut roaster tank anyway. 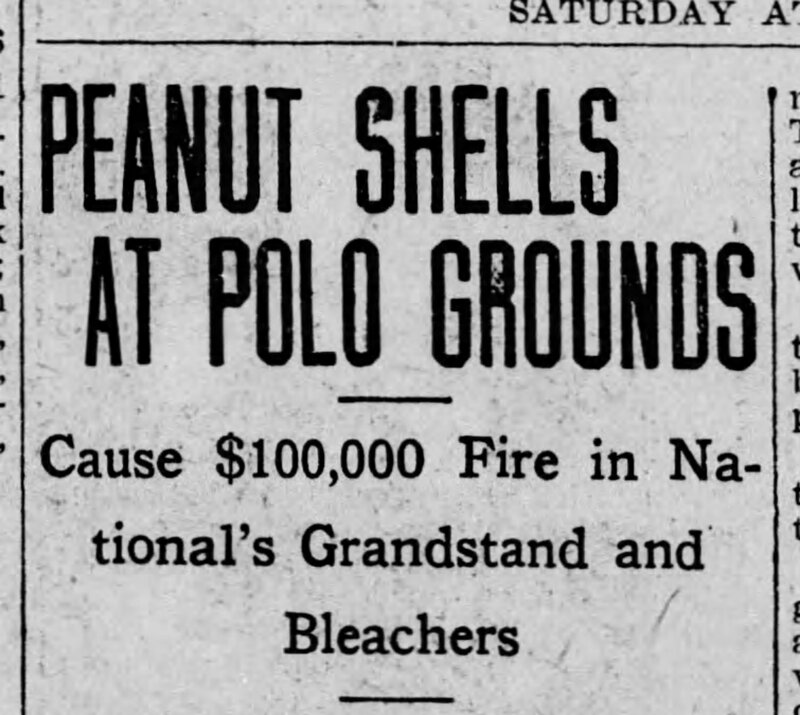 Some claimed that peanut shells, dropped by fans and collecting in a thick layer under the grandstand, provided ideal tinder for the still-lit cigarette and cigar butts that fans dropped down there, too. “Bugs” Raymond, a Giants spitball pitcher, claimed he saw a smoldering fire around the shells during the game and alerted nearby attendants. But, this isn’t about peanuts. The fire spread, destroying nearby elevated trains and station entrances. And, it didn’t take long before some 10,000 Harlem neighbors saw the flames and raced to the scene to watch the four-alarm blaze. The local water pumping station had been closed for repairs, so water pressure was compromised. A steel tank meant to provide water to the Grounds in the event of fire hadn’t been filled. “[T]here it stood throughout the fire, doing no good to anybody,” The New York Sun reported. The Sun also reported that sparks from the fire jumped from the grandstand to second base which had begun to smolder until a baseball official stamped on the bag, grabbed it, and hauled it to safety. Second base was saved. The team’s baseball bats were not so lucky. “Ball players are superstitious about the bats they use. Over 100 bats, belonging to all members of the team, were burned, and not a single stick was left,” The New York Times reported. 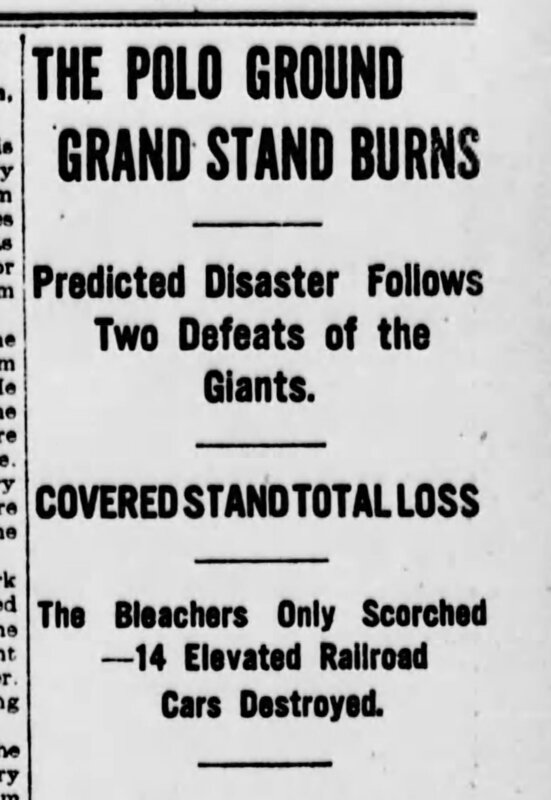 Initially, Giants manager John McGraw told reporters he thought they could clear out enough debris and put chairs out amongst the smoldering ruins and play their scheduled game that day. The game was ultimately cancelled. Fires were commonplace in the days of wooden things and poor safety protections. You know the “Asch Fire” by its other name, the Triangle Shirtwaist Factory fire. Just a month earlier, a fire at the Triangle Shirtwaist Factory in Greenwich Village, just nine miles south of the Polo Grounds, had killed 146 garment workers – mostly young immigrant women. It was one of the deadliest industrial disasters in U.S. history. Just a few weeks after the Polo Grounds fire, a small fire in a hayshed spread so quickly that it destroyed nearly all of downtown Bangor, Maine. Aside from reminding you that the Good Old Days weren’t all that good, this isn’t about fires or fire safety. But, it is about 1911. 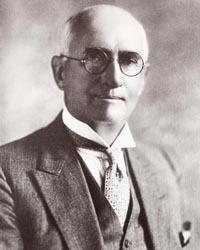 1911 is also the year that Crisco was invented. And, binder clips. And, thanks to Michigan’s Edward Hines, the center line on the road. Edward Hines deserves a holiday to celebrate the fact that cars are separated on the road by his center line. I’m serious. And, the first motorized movie camera was invented. In 1911, a Swedish company made a film of everyday life in New York City. The seven-minute film, still in mint condition, was recently released by the Museum of Modern Art. Guy Jones, a talented YouTuber, took the film, adjusted the speed and added ambient sound. That unnatural herky-jerky speed is part what makes old film so queerly unrelatable. But, when the speed is corrected, the effect is mesmerizing. New York Harbor. The Statue of Liberty. The Flatiron Building. Battery Park. The Brooklyn Bridge. Traffic, people, and life. I wish some baseball was included, but, unfortunately, there wasn’t. The year peanuts burned the Polo Grounds down. This entry was posted in Baseball, Baseball History and tagged 1911, 19th Century Baseball, Fire, NY Giants, Peanuts, Polo Grounds by Jackie, The Baseball Bloggess. Bookmark the permalink. Wow. This is terrific. Thanks, Bloggess. That film is just extraordinary, isn’t it? I hope that other old film can be corrected in the same way. Watching it unspool at a proper speed changes everything! Wow. Just, wow. There is some footage of San Francisco, seen from a streetcar on Market Street, that is very similar, but it’s not as clear. This one makes me wish I knew New York, as I know SF. Thanks, so much, Blogess! I love your widely-ranging mind, that creates articles about so much more than baseball- or, rather, places baseball in a much wider context. I’m sure a lot of work goes into something like this, and I appreciate it. Thanks, again, and may your Birds take wing. It’s early yet. I have often wondered what it must have been like to lose both the Giants and Dodgers to California in short order … it must have been such an unusual thing for the wider New York community. I know so many New Yorkers today who are still angered by their childhood loss of their team (including Bernie Sanders whose political leanings were influenced by the loss of the Dodgers). Thanks for your sharing your post. I will never think of peanuts the same way again. I thought peanut allergies were the biggest peanut danger at the park … come to find out they can burn a place down! Loved this one. Peanut shells and vintage NYC scenes…and you meshed them together! 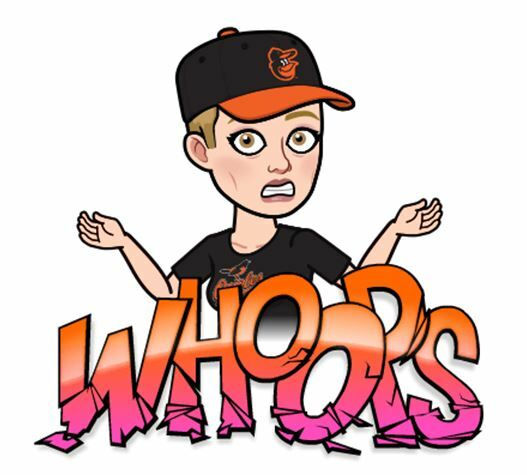 And the Orioles gave had a descent last week…celebrate! Had a few dumpster fires this weekend in SF. Pitching…enuf said!